Part of my role as a grassroots worker is to know about government schemes that women in Manipur can get help through. Most of the time the women themselves know very little about them. I keep a diary where I note down details of any such schemes for easy reference. At the beginning of this month the government of India launched a new project providing free medical help for poor pregnant women. This initiative called Janani-Shishu Suraksha Karyakram (also known as JSSK) allows pregnant women to get completely free, cashless services, including natural deliveries and caesarean operations. Mothers can also get free treatment for sick newborns up to 30 days after birth in government health institutions in both rural and urban areas. The treatment also covers any necessary drugs as well as transportation charges, blood transfusions, if needed, and any diagnostics. 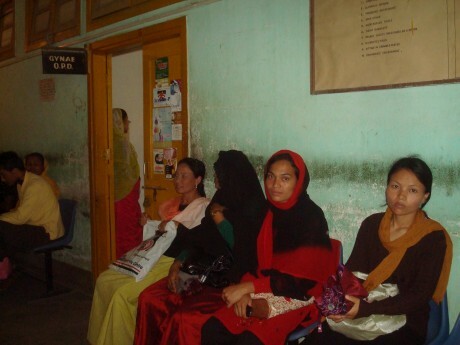 Birthing in Manipur was traditionally overseen by the women in the community. Elderly women of the family and neighbourhood would help a woman deliver her child. Sometimes a Maibi (female traditional physician) would be there to assist the birth. The Maibis also conduct many religious rites for a long and productive life of the child. However, in the past few years there has been a shift from these home deliveries to institutional deliveries under the supervision of a doctor or trained health personnel. But this option is mostly confined to urban areas. In the interior and rural regions, home deliveries, with or without trained midwives, are very common. Prior to the JSSK scheme, poor women could get help through Janani Suraksha Yojana (JSY). Also centrally sponsored, this programme similarly aims to reduce maternal and infant mortality rates and increase institutional deliveries for women living below the poverty line. Under the programme women are able to get check-ups before and after the birth. If the child is delivered in a hospital, the mother got paid – Rs.700 (£9.60) in rural areas and Rs.600 (£8.20) in urban areas. The health worker also got some money for their work. However, although the women were ultimately paid they had to pay themselves for other things along the way. Because JSSK covers all treatment and other associated costs such as travel, it takes away any monetary burden on the women during their pregnancy. In the past two years I have helped three women in my locality get treatment through Janani Suraksha Yojana.